Now - we all know that Choux Pastry is very very sinful - but who cares, right? 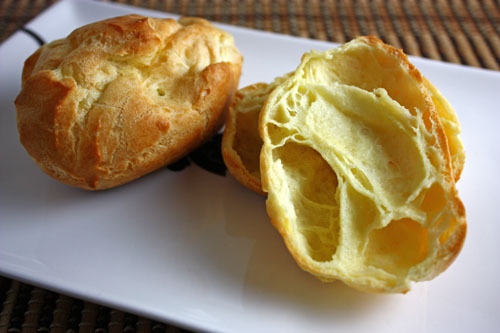 This is the pastry used for profiteroles, and croquembouche which sometimes makes an appearance as a wedding cake. Preheat the oven to hot 200 degrees celcius. Put the butter in a large heavy- based pan with water and stir over medium heat until coming to the boil. Remove from the heat and quickly beat in the flour. Return to the heat and continue beating until the mixture comes together and leaves the side of the pan. Allow to cool slightly. Transfer to a bowl and beat to release any more heat. Gradually add the beaten egg about 3 teaspoons at a time, beating well until all the egg has been added and the miture is thick and glossy - a wooden spoon should stand upright in it. If it is too runny, the egg has been added too quickly. Beat for several more minutes, or until thickened). Spoon the mixture onto two baking trays, leaving room for spreading. A heaped teaspoonful of mixture will make 1 small puff. Sprinkle the baking trays with water - this creates steam, helping the puffs to rise. Bake for 20-30 minutes, or until browned and hollow sounding, then turn oven off, leaving the pastry in the oven for about 5 minutes to "dry out".